Russian Defense Ministry says their most modern ballistic Bulava missile was launched from a submarine in the Barents Sea on Monday. The test-launch came from “Yury Dolgoruky”, the only Borei-class submarine sailing for the Northern fleet with homeport in Gadzhiyevo on the Kola Peninsula. The Defense Ministry says the missile’s mock warheads reached their designated targets on the Kamchatka Peninsula’s Kura shooting range in the Far East. 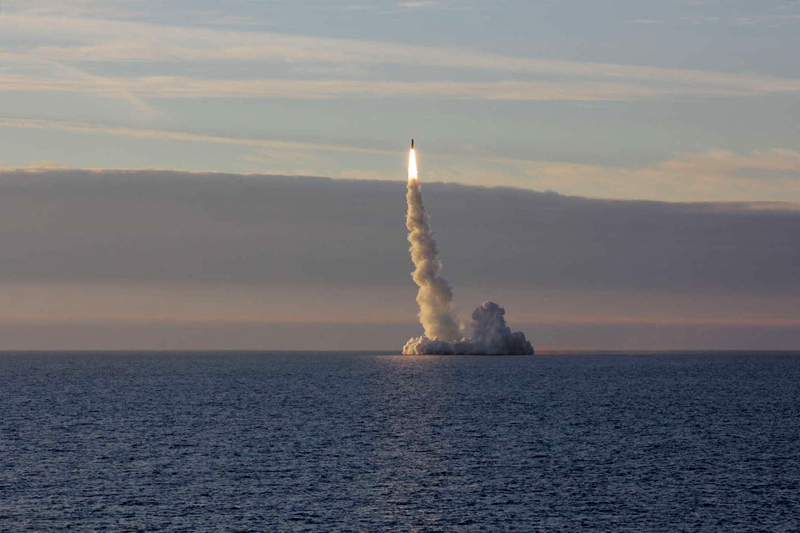 The launch was done from submerged position in the waters northeast of the Kildin Island in the Barens Sea, north of the Kola Bay. Just hours after the test, on Tuesday morning, Norway’s Foreign Minister Børge Brende crossed the border to the Kola Peninsula. Brende is on his way to visit the Northern Fleet’s Cold War nuclear waste dump in Andreeva Bay, where Norway has spent tens of millions of Euro on infrastructure upgrade to secure the nuclear waste. In Andreeva Bay, Børge Brende and the Norwegian delegation will wave farewell to the first shipment of spent nuclear fuel from submarine reactors that have been stored in the area for more than 30 years. Since the mid-90s, Norway has spent nearly 2 billion kroner (€210 million) on nuclear safety projects in Northwest-Russia, most of it on decommissioning of Cold War submarines and securing storage sites for naval nuclear waste accumulated from the operation of the Northern Fleet’s submarines. Russia is currently building a new fleet of both multi-purpose submarines and ballistic missile submarines. Three Borei-class sub, carrying Bulava missiles, are so far commissioned. Two of them sail for the Pacific fleet, while “Yury Dolgoruky” belongs to the Northern Fleet near Russia’s border to Norway in the north. Another Borei-class submarine will be floated out in August this year, to be followed by another four in the years to come.